Today The Man On The Train releases in the U.S. via On Demand, iTunes, Amazon Watch Instantly, and Vudu. 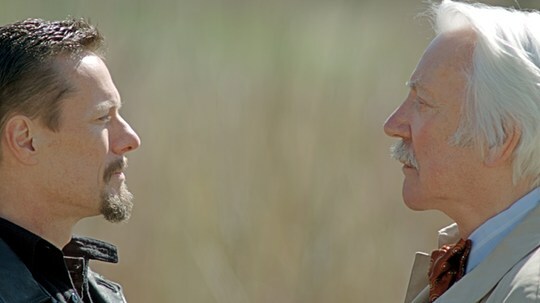 This remake of the original French film stars legendary actor Donald Sutherland opposite U2 drummer Larry Mullen, Jr. making his acting debut in the leading role. The director, Mary McGuckian, recently shared insight into the making of the film with me. What follows is our interview. TK: The original Man On The Train (2002), directed by Patrice Leconte, is very critically acclaimed. I read that you aim in your productions to make contemporary works more compelling to modern audiences. The original of this film isn't that old of course, but the way it was shot makes it feel almost like a classic. Did that factor into your decision to choose this specific film to remake? MM: The contemporary classic style of the original was more a factor that influenced the production choices for the picture's remake rather than a factor which influenced the decision to remake it in the first place. Patrice LeConte's original is justifiably considered a contemporary classic for good reason. Something I came to appreciate all the more during the detailed analysis that was an inevitable part of adapting it for an Anglo-American audience. No matter how hard I hit it against the wall, the core of the film always sprang back full of bounce. So well designed as to be indestructible. In the original film, the man often referred to as France's version of Elvis, Johnny Hallyday, plays the role of the bank robber (The Thief) that Larry plays in your version. Did you deliberately want a rock star for the role? I've heard Larry referred to as the 'James Dean' of the band. That's good enough for me. Are there any vast differences in the role of The Thief from the original to the present version, other than calling him The Man vs. The Thief? The film is an adaptation to Anglo-American culture as well as the English language. True to the spirit of the original, I hope, but transposed rather than simply translated. The role was rewritten in collaboration with Larry as it was intended from the outset that he would play it. Generally, I try to write the dialogue/rhythm and voice of a character with a specific actor in mind and so the narrative structure of the adaptation may seem very similar to the original, the character is a different man from a different place, created by Larry from the script on which he made some excellent comments through various rewrites. For my money, he's taken the original character on a subtle but significant journey. U2 fans have heard for years that Larry Mullen Jr. was interested in acting. We were encouraged by his starring role in the band's "Electrical Storm" video back in 2002, but had no idea he would be acting in a feature film. How did you choose him for this role? Did you always have him in mind or did he audition traditionally as everyone else did? Ah... In hindsight, I think the actor chose the director in this case, rather than the other way round. The project emerged as a result of a conversation about the potential pitfalls for rockstars who have a yen to exercise the acting bug. L'Homme du Train (the original French title) came up in that conversation as an example of a rock-star-turned-movie-actor success story. It wasn't until after shooting that I discovered from the original producer, Phillippe Carcassonne, that Patrice LeConte had actually conceived the film at Johnny Halliday's request. Prior to that, the film had struck me as extremely well cast. Both Jean Rochefort and Johnny Halliday received many awards for their work internationally. Factors which contributed to Halliday's success in that role were construed as a combination of his being cast in a role that was well suited to him, enhanced inevitably by his finding himself playing opposite arguably one of France's most renowned actors in an essentially two-hander heist movie, with all the benefits of comfort-zone that a controlled boutique-style production imply. Larry responded to the possibility of 'trying out the acting idea' with all of the same advantages. A suggestion was that he find a project like L'Homme du Train for all the same reasons. I wasn't quite expecting the response I got some months later when he had had a chance to view it. Which was, rather than "Yes," something along those lines might be an interesting first movie, it was more along the lines of "Why don't we have a go at doing this?" The film was shot on location in Ontario, Canada. Why was this location chosen as opposed to the original French setting? To add to the above, the adaptation also travelled the film across the Atlantic. In the original, the setting was a fictitious town somewhere in the middle of France. We shifted the setting to a non-specific eastern-seaboard North American (as it happens, Canadian) town. A combination of production exigencies and the desire to find a location that was geographically authentic to the needs of the story brought us to Orangeville in Northern Ontario. Tell me how well Larry and his main co-star, American actor Donald Sutherland, worked together during the shoot. Did they know each other before filming? They met, as actors often do, just before shooting. An unlikely pairing in a film about an unlikely relationship. Donald Sutherland is undoubtedly one of the great 'monstres sacre' of contemporary cinema, so his involvement was as daunting as it was an exciting prospect to all of us. As you would expect, his generosity of spirit and his no?holds barred investment of a wealth of experience, expertise and extraordinary intellectual and emotional energy blew us all away. As courageous as it was for Larry to take on a principle role on his first outing, it was a privilege to witness Donald give everything to the part and the project never once remarking that well ... Larry had never done this before. And you would never have known, as from the very first shot, he was so in character and filming so well, that we all simply forgot. We can assume from his years of touring and making videos that Larry is well-versed in the process of being on camera, but what was he like as a first-time lead actor? Did he offer suggestions about his character or the script along the way? Absolutely, Larry has amazing instincts on camera. He has that indescribable thing movie stars have. A quality on camera that can neither be learned, analyzed nor taught. You've either got it or you don't. I imagine it's a somewhat nail-biting experience to cast a rock star in your film who is currently on a major international tour. Did Larry's commitments to U2 ever interfere with the production? All of our concern was to ensure that the production would never interfere with his U2 commitments. I hope and believe we pulled that off. Unbelievably short, given Larry's day-job commitments. Who composed the film's music? Was there ever any discussion of U2 contributing music for the soundtrack? Larry composed the main theme with Simon Climie, variations on which form the bed-rock of the score. And they are still working with it -- once it's finished, you will most likely be able to find it on iTunes. Indulge us: are there any funny stories or anecdotes you'd like to share from the filming of the movie? I noticed that Larry's longtime partner, Ann Acheson, is an associate producer for The Man On The Train. Tell us about her connection to the film. Associate Producer is a poorly defined role as it can refer to very little (such as somebody-in-some-way-connected-with-somebody-who-had-something-to-do-with-some-aspect-of-producing-the-film who wanted a credit) through anything in between to a great deal, (i.e. somebody indispensable). Ann falls into the latter category. [She was] fully integrated into every aspect of the production from the very first suggestion of investigating the feasibility of it, remake rights options, script adaptations, meetings with actors, all the details of budgeting and financing options and issues, through practical production scheduling including managing Larry's quite detailed preparation program, script editing and script management. I've never seen such a master of colour-coded script scheduling! We shot the film in record time and still didn't go over time on a single shooting day as Ann managed the scheduling of all Larry's other commitments in and around preparation, rehearsals and shooting. On set, it turned out that she was a wizard with the continuity team and knew exactly what the edit notes should be for every take. So much so that after a few days I gave up rushing back to continuity between shots to give the notes as I could tell from the look on Ann's face whether we had the shot or not. The entire cast and camera crew took to looking back to her at the end of every take as she stood focused in her earphones on the monitor to see whether we got the little nod. Both Larry and Ann as producers continue to be involved in all aspects of the picture's completion, delivery and distribution. As an observant fan, I get the impression that Larry sometimes has the "final say" in U2 matters. Do you think it was hard for him to not be the 'person in charge' as you filmed? The relationship between an actor and director for me is essentially collaborative. Every aspect of this production was pretty collaborative. Perhaps the director's hat does get the last say with the actor ... but then Larry did have a producer's hat as well! Although early reviews of Larry's acting are glowing, do you think because he's a rock star he will have a harder time proving himself to critics as an actor if he continues down this path? It is an act of courage for any actor, every time they expose themselves in a role on camera, and always impossible to legislate for press reaction. What matters is that he wanted to do it, he did it and it's done. Films, like running water, find their level. Tell us about the film's release (both in North America and abroad). The film was made for a North America/English speaking audience. It will be released in the US by Tribeca beginning Oct. 28 On Demand via Cable VOD on all major cable providers, iTunes, Amazon, Watch Instantly, and Vudu. Thereafter, Alliance Atlantis will release it in Canada. I'm not sure the French, though, will want a remake of a classic by one of their most revered directors served back to them in cold English! Other international territory dates are still pending. Right now I'm in finishing mode on a film called The Novelist with Eric Roberts in the title role, and about to start another French based project, The Price of Desire, about Eileen Gray, the famous Irish architect/furniture designer and Le Corbusier. Do you think Larry will continue acting? If so, would you like to work with him again? I hope so. And ... I very much hope so. Photo credit: Sophie Girau. Courtesy of Tribeca Film.